Arriving in Italy is always a treat: the language is accessible, the scenery is interesting and a trip to the supermarket always rewards with good quality produce and easy choices. Italy also thrills us with the surprising adherence to its new no-smoking laws in most public places. And we've crisscrossed Italy so many times that its hard to select a route that is entirely new, which gives us some comfort from the familiar. We arrived by ferry from Greece and our short visit to Albania at the eastern port of Ancona and, after searching the hotels on line, decided to head for a hotel we'd already patronized. We knew that they'd graciously stash our bikes and we'd already sorted out the confusing neighborhood roads. 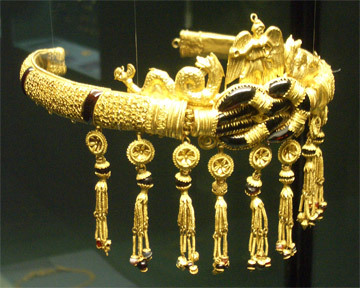 Sticking with the familiar allowed us to make a beeline for the hotel, drop off our belongings, and take in the regional archeology museum that we'd missed on prior visits. The 20-30° F drop in temperatures from what we'd been enjoying in Greece and Albania came as a shock however, and we struggled to adjust to the biting winter wind. Our 2005 touring season wasn't originally planned to end in December as we expected to fly to Australia and New Zealand and bike there for several months. And when we decided to fly home in early December, we had anticipated doing some serious riding our last 2 weeks in Italy between Ancona and Florence. So, after our overnight ferry ride to Ancona and an overnight stay in the port city, we were anxious to hit the road for some invigorating cycling. But the season came to an unusually unceremonious end with unseasonably cold weather curtailing our efforts. It was only our second riding day west out of Ancona that we encountered snow in the hills. As we rode towards our destination, the snow line was only a couple hundred of feet above us. The temperature was hovering just above freezing for the 4:30pm sunset as we looked for a hotel room. By bedtime snow was obscuring the town. 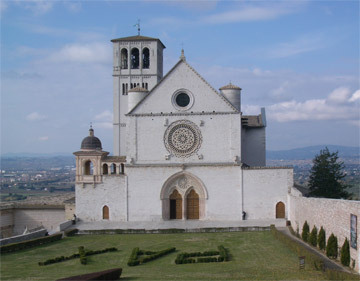 Snow-free & sunny in Assisi. We were only at about 1000' above sea level and the next day's ride that required crossing a relatively low pass no longer looked wise. At $91 the available hotel room was expensive but with less than 3 hours of heat in the afternoon-evening period, the price became outrageous. Despite the snow, there was nothing that invited us to spend a second night: too little heat, no chance to catch up on the TV news, and no WiFi connection for our laptop. We'd take the morning train to Perugia where we had expected to ride to over the next 2 days--perhaps there we would escape the snow and find a little more warmth indoors and out..
We were thrilled with the train ride to Perugia as the snow got deeper as we left our overnight stop at Fabriano, validating our decision to take the train. And by the time we got into the next valley and Perugia, the snow was but a memory. We were delighted to be greeted by the promised warmer weather. 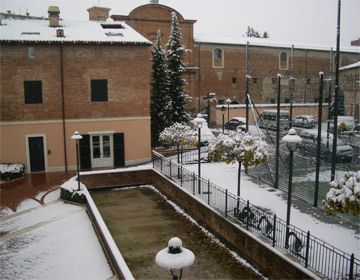 Our less expensive and more comfortable hotel in the heart of the old town made a good base for sightseeing on foot in charming Perugia and for taking a bus ride to the nearby ancient city of Assisi. But the weather again slipped way from us in Perugia and we chickened out by taking the train when we departed. It was only to be a short hop and then we would bike the rest of the way to Florence. The last few months had felt more like 'traveling with bikes' instead of 'traveling by bike' and we were still looking forward to some time in the saddle. But as we looked out the train window at the flooded roads and rising water, we decided to pay the surcharge for changing our tickets once on board and continued on to Florence. It was the right decision, but that was the sudden end of our riding season. 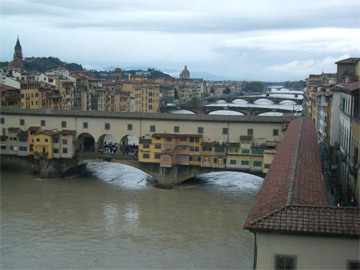 High water in Florence's Arno River. Previously we've always treated ourselves to a serene last day or 2 of riding where we turned our attention to deeply taking in the experience of the countryside and savoring the sensations in our bodies. We would reminisce, reflect, and say our goodbyes to this most recent phase of our cycling adventure and of our lives. But not this year--we loaded the bikes on to trains twice fully expecting to do some lovely countryside riding and instead we merely used the bikes to shuttle between the train stations and hotels. While making peace with our truncated bike trip, we shifted our focus to the immediate future by buying cheap suitcases at Florence's street market to get most of our gear home and back again in March, and by renting a storage locker. Our bikes and a small stash of clothes and books would spend the worst of winter in Florence without us. There was no denying the biking season was over once we snapped the padlock closed on the locker door and no denying that we'd be heading home soon. Taking the train instead of biking left us with a few extra days with which to satisfy Bill's longing to see a little more of Munich. A 9 hour train ride on a rare, mostly clear day whisked us from Florence to that southern Germany city. Our mid-week ride landed us a private compartment with no train changes, so we nestled in for the long day. The trip was a montage of prior experiences in the region and we especially enjoyed seeing the Alps under the cover of snow. The train passed through Bolzano, a city in the foothills of the Alps we'd visited a number of times before, including this year, by bike. Memories came flooding back and we fondly ogled the scenery and intermittent bike routes. Italy had been brisk but the temperatures dropped another 20°F in Munich. Snow was on the ground, some of the sidewalks around our hotel were slick with ice, and the day time temperatures usually didn't make it out of the 20's. The only reprieve was the lack of wind. We layered on everything we had and scooted around between the hotel and museums on the underground and walked gingerly on the sidewalks in our sandals and waterproof socks. The only glitch in the plans was that one of the 2 suitcases purchased in Florence started falling apart on its second day out as we left Munich for Frankfurt. A lot of pondering and a stray strap from a bike pannier saved the day and we were able to limp into Frankfurt with it. We crossed our fingers and hoped it would make the planned journey home and then back to Florence. Cities and countries fly by quickly on the big wheels and after a few days in Munich, we hopped a train for the 4 hour ride to Frankfurt. Ever cautious, we arrived a day before our departure home to allow for the unexpected, like strikes and storms. Frankfurt is another city we've passed through several times, making for an easy transition. We knew the route to the hotel, the nearby internet shop, and the inner city supermarket. Our Frankfurt experience was reduced to mostly dealing with the "To Do" list: electronic housekeeping on our webpage, catching up on emails and shopping for language and bike route books. Christmas market in Munich's town square. Our brief Germany stay unexpectedly fulfilled a small fantasy of mine, which was setting us up to study German and Italian simultaneously. We bought a calendar tablet that has a lesson in Italian on 1 side with the translation in German on the back. The German is out of reach for me, but it is do-able for Bill and the Italian side is a stretch for both of us. But rather than fret about being perfect students, it spoon feeds us opportunities to practice reading and pronouncing. We also bought a small deck of cards for children with questions in Italian on 1 side and the answers in Italian on the other. It's a haphazard approach but we hope the calendar and cards will nudge us to keep working on our language skills throughout the year. And they both make dandy study aids to whip out of a pocket as we walk along or are waiting in line. 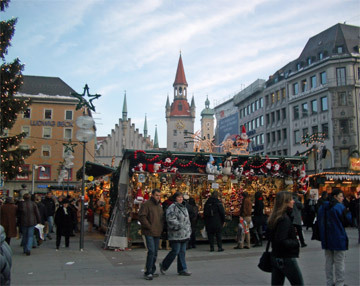 Our other German treat was strolling through the Christmas bazaars in both Frankfurt and Munich. Both bazaars were upscale, outdoor craft markets with a healthy dose of snacks intermingled in the booths. It was the smell of hot mulled wine served in charming holiday mugs that repeated captured our noses on the cold evenings--that and the anise candies. The wursts and sugary treats were easy to pass on by, but the mulled wine kept turning our heads. This well-traveled pup has his own passport. The next morning, a short walk from the hotel to the train station and a short ride to the airport would make the planned easy start to our 11 hour flight home through 9 time zones. And having stashed the bikes and some of our gear in Florence would make the trip home, especially through the post 9/11 security, much easier. It wasn't until just before landing that we discovered that this dog and a nearby cat had made the long flight under their owner's seats. 2005 will be remembered as the year of severe logistical challenges. Route planning for our travels is a constant effort for Bill who is perpetually scouting for better maps, more information and more rarified routes. But 2005's obstacles went well beyond the norm. We literally spent days assessing how to safely exit Serbia with the threat of violence on the Macedonian route and the worsening international truck traffic on the Bulgarian option. A minor drama was folded into those debates, which was researching where and how to have my repaired eyeglasses returned, as the options in eastern Europe were both more limited and more expensive. The increasing violence in Turkey added to our concerns and the "Go--No Go" decisions were left to the last moment before we entered the country to maximize the amount of current information. Once in Turkey our logistical distress didn't abate as the problems of getting to Australia/New Zealand were before us. We were pained to discover that traveling to 'down under' with bikes couldn't be undertaken with the same casual attitude as could be done in Europe. Again, after devoting full days to research and decision-making, we finally bailed and decided not to go. About 20% of our stay in Europe in 2005 had been clouded by logistical distractions involving only 3 destinations. Though clouded by terrorism and traffic safety issues, 2005 did mark the return to greater safety in that it was a "no flat tires" year. In 2004 our favorite tires had been discontinued and our second-best choice was a terrible disappointment. I think at the worst we had 3 flats in 1 day in 2004. Almost all of the flats occur in the back tires as that is where the weight is concentrated and that also that makes changing the tire harder as all of the gear on the back rack must be unloaded. But the heavy and heavy duty German Schwable Marathon + tires we hauled to Barcelona from Portland in 2005 were worth the trouble--we rode over 6,000 km (3,700 miles) without a flat on any of our 4 tires. The big gear disappointment was our new Burley waterproof jackets that leaked like sieves through the pit-zip zippers, which soaked down the sleeves of our clothing. Fortunately it was a much, much drier year than 2004 so it wasn't the crisis it could have been. Our best remedy for making it through the season with them was buying disposable and then cycling-grade ponchos to wear over the jackets. My hopes for the Burley jackets being at least good for walking around were dashed in early December in Munich as my clothing got soggy in the sleeves when we strolled through the Christmas market in the rain for an hour or two. We have few bike equipment failures because of Bill's aggressive preventive maintenance program but we had a new wrinkle this year when the rail (the metal attachment bracket) on my bike seat snapped in two. We've never had that problem before and were surprised as the expensive saddle was just over a year old. A saddle is a relatively easy thing to replace but not always with the quality one wants and a different saddle can throw off the all important fit of the bike. It was in Istanbul where our riding had dropped off and was going to be nonexistent for another 10 days of sightseeing that we hit upon a new conditioning regime: stairs. We always try to take the stairs rather than elevators when we aren't riding but in Istanbul we upped the ante by doing doubles: going both up and down the stairs 2 at a time. Within just a couple of days I felt a new stability around my knees that is often lacking and the pattern of knee discomfort that I usually get when my riding level drops didn't flare up. Amazing! Bill had been advised when in Portland last winter to climb stairs or hills to develop the Vastus medialus, the inner most of the quad muscles of the front thigh. That's a muscle that is underdeveloped in cycling and that may have contributed to his sudden-onset knee problem in 2004. Armed with that information and my success in staying upright in Izmir, we aimed for doing about 20 flights of stairs up and down each day while we were in high-rise hotels in Munich and Frankfurt in December. Most would be 2 stairs at a time, except for a few flights of singles to warm up and cool down. 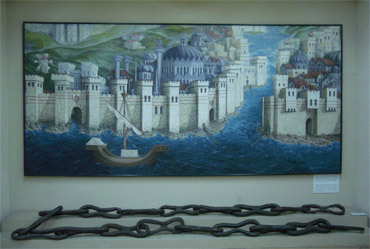 The Byzantine's chain to block the Ottoman ships at Istanbul. Our 2005 cycling season that started in Barcelona was shorter than planned but included our favorite show-stoppers: the Dolomites of the Italian Alps and Turkey. Istanbul got checked off my short "Must See" list as did the Matterhorn, Gallipoli, and Munich on Bill's list. We also had the satisfaction of picking up places on our ongoing "Next Time" list of places missed our first time through a country or region. This year those places included several painted caves in southern France and the ruins of a half dozen ancient Ionian cities on Turkey's coast line. Touring in the more challenging countries of Bulgaria, Serbia, war-ravaged eastern Croatia, and the southern tip of Albania added a sobering edge to our experiences. But those realities were balanced by the extra fun of rendezvousing with US friends in the Italian Lake District and Istanbul. Printing out our 600 or so photos and assembling them with dozens of postcards in another pair of thick albums was a great way to remind ourselves of the delight we had known and the things we had learned throughout the shorter traveling year. "What does it feel like to come home after so many months abroad?" is an often-asked question. Of course, it is a little different each year. The first year the culture shock in being back home was pretty intense but now we switch between the continents with much less effort. Dinner with family & friends. I imagine it is like moving between a first and second home: both are familiar, both are welcome for different reasons and both are constantly changing. Being back in the Portland/Vancouver area offers us the chance to reconnect with deeply rooted traditions and experiences but being in Europe connects us with that which is newer in our lives. Looking at both the Euros and the dollars in my wallet triggers memories and associations with both worlds, both of which I enjoy. Though our time abroad is always inherently unsettled, it does have its familiar features and routines in a few locations. Just like when we arrive in Portland, we know our way to the nearest Trader Joe's market; when we land in Frankfurt we'll know where to buy groceries after we drop our bags at our centrally located hotel. Just like with the process of learning the in's and out's of an unfamiliar part of your city, learning to navigate around Europe brings its own satisfaction. It's always a treat to be home: to be among family, to reconnect with friends, and feel the comfort of familiar surroundings and routines. But we were disappointed to see in our first 10 days back home how many glitches we were involved in. We were delighted to mail off our laptop for servicing on our second full day in the States, but horrified when tracking the package to discover that we had been given the wrong address, delaying the delivery. Incredibly, when the laptop was shipped back to us a few days later, it again had an address error, again delaying delivery. Had we been more vigilant about checking our phone messages and emails we could have saved a day on the first shipment error, but we were out of the habit of being that compulsive. Twice Bill prevailed on 'killer deals' on electronics sales by having the ad in hand at the store--deals that the employees were clueless to and only the physical evidence and perseverance allowed him to collect on the specials. His vigilance at the cash register at one store backfired however: the clerk correctly rang up his electronics discount under his watchful eye but charged him $48 for a butternut squash, an error he hadn't noticed until putting away the groceries. Fortunately the price adjustment on the squash took little lobbying. Our not-noticing also delivered one good surprise, in that a $65 purchase I made only cost me half the price. The tag showed a discount of about $10, but I was one of the few customers that wasn't greeted at the door with the announcement of the 15% early bird special and the 30% off everything special. Luckily, I didn't need to know to get the discounts as had been the case with Bill's electronics. Our confidence at being good shoppers and back in the 'pro-consumer' culture of the US was rocked a bit by these early experiences. Being told "That's no longer here", "They moved 3 years ago," and "We don't do that any more" at 3 different locations in 1 day underscored what we knew: we are out of the loop. Yes, we still know our way around town and favorite old places to shop, but our database is increasingly obsolete. Independent-minded Mojo reminded us about living with cats. We changed the rhythm of our longer-than-usual stay in the States by house-sitting for a friend while she took her dog out of state for radiation treatment. We are usually completely based at the house Bill grew up in that is now his sister's home, so we enjoyed the change in routine--after all, we aren't accustomed to being in any one place very long these days. 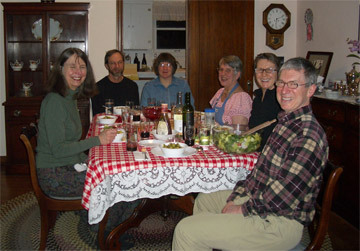 Most of our time spent on the outskirts of Portland was around the holidays when our calendar wasn't so full with appointments and socializing. It was fun living with 2 cats for a while and we overlapped with the 2 dogs a bit too. Once the holidays and jet lag had passed, it was time to get serious about tending to our business affairs. The advocate we hire to help manage our affairs while out of the country presents us with a small pile of carefully culled mail when we return but then for the 2 months or more that we are at home, we have to deal with the full force of the mail. And of course, with actually looking at all of the mail comes the niggling little reminders, the "We really should follow-up on...."
Last year delving deeper into our business matters was limited to doing more to protect ourselves from identity theft, finding evacuation insurance to cover us for the entire year to replace the insurance that only covered 90 days instead of the annual coverage that we thought we had, and finding another bank to provide 0% transaction fees abroad as we had when we started traveling but that had drifted up to charging 2% on each withdrawal. This year our business chores shifted from the banking sector to insurance, with re-evaluating the competitiveness of our long term care insurance and reducing our skyrocketing health care insurance by increasing our deductible. 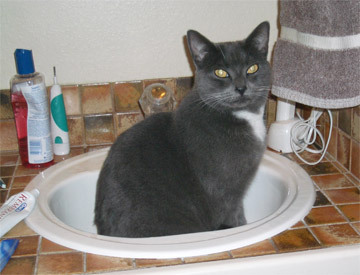 We once again searched for dental insurance but found nothing sensible. And we opened a few cans of worms at our former home that is rented through a property management company. We have to grit our teeth to deal with unpleasant and expensive matters that we largely forget about throughout most of the year. Our time at home is our catch-up time so both the good and the bad get compressed and we were disappointed to be mopping up the last details the day before we flew back to Europe. 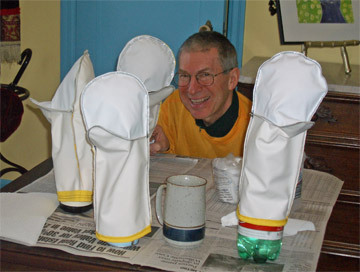 Bill taking his turn at waterproofing seams on new overmitts. Our hours spent negotiating our way through the maze of bureaucratic details on our business affairs were interspersed with activities that made us look like candidates for treatment of obsessive-compulsive disorder (OCD). As in prior years, we fiddled with the details of preparing for another touring season, things like filing the rough edges off 2 new plastic spoons; replacing 24 ugly buttons on 2 sunblock shirts; dabbing waterproofing sealer into the stitching holes of our homemade overmitts; repositioning the Velcro strips on 2 pairs of sandals to allow for bulky winter socks; and hacking an inch off the length of sunglasses--all things that would look like sheer madness to the observer. Yet for us, each of these items are one-of-a-kind and many will be used every single day of the touring season. Saws, files, and sewing machines are only within our grasp for 2 months of every year and yet the suboptimal details will haunt us for months. So, despite the seeming absurdity of it all, we patiently devote hours to stitching, hacking and modifying our new purchases to mold them into well-groomed traveling companions. Bill has been a bit of a late bloomer when it comes to time management skills but surprisingly, the challenges of retirement have taught him what he never mastered while employed. Of course, it's a bit of 'good news-bad news.' Bill was so much more organized while at home this year that we found ourselves wallowing in the depths of chores that we've never had time for. Untangling the web of contradictions in his disability policies; confronting expensive maintenance realities at our rented-out home; updating lists of accounts and policies; and re-inventorying our 2 safe deposit boxes were all very virtuous chores that were long over due but wildly unpleasant to do. Bill's new level of organization paid big dividends when his glasses snapped into 2 pieces as he rubbed a spot off the lenses just 3 weeks before flying back to Europe. He was able to schedule an eye exam at Costco, select new frames and get new glasses back on his nose a couple of business days before our departure. Bill taking his new hula hoop for a spin. The most exciting new feature for the 2006 cycling season will be Bill's refitted back. Our massage therapist discovered that 2 of the lower vertebrae in Bill's back had become sort of glued into the wrong position--probably for years or perhaps decades. Where his back was supposed to curve in, it was fixed so it curved out. The hard work from the massage therapist and enduring some pain on Bill's part freed up the old adhesions and Voila! Bill's back was in a healthier position. Of course, it wasn't quite that simple. It took about 6 weeks of living like he'd just had surgery to allow his back and surrounding muscles to adjust to the change. The importance of proper lifting was no longer a point of discussion, as pain was a good teacher and Bill quickly began lifting heavy objects like an instructor for a "Healthy Back" class. The weakness and instability that felt like it would never pass of course did and just before we left town Bill was discovering a new power on his bike that he never had--nothing like lining up the parts right to get the machine to work well. It looks like bad news for me however as he has probably shed the hidden handicap that equalized our power on the bikes. 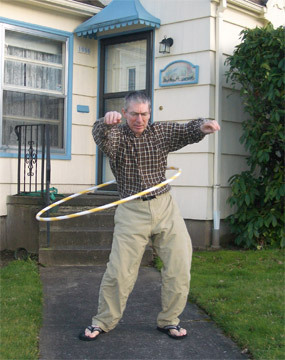 And when Bill's back was finally sturdy enough, he took a few twirls with the hula-hoop I bought as a lark on Christmas Eve. It had been hanging on the wall, waiting weeks for a little spin before we took off for some unknown number of months. More time for online research and lower prices makes electronics shopping a major pastime for Bill while we are at home. 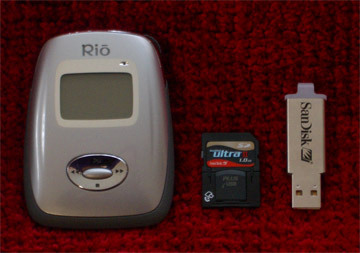 Though it was on his list for 2007, Bill treated himself (and us) to a little Rio recording device--it's like an iPod. It has the footprint of a credit card and the capacity to store about 70 CD's, which went a long way towards satisfying Bill's craving for music while abroad. Each morning before breakfast Bill would get online with our laptop and being downloading music albums onto his tiny Rio. He is expecting to use the speakers on hotel room TV's to fill our traveling lives with music. And since the Rio is so small, it can be packed at the last minute in the morning, unlike the laptop on which he had recorded a few of our CDs. Bill's tiny new music box & even smaller laptop backup devices. The unfortunate sinking of a ferry in the Red Sea had me revisiting my image of escaping flames, floods and earthquakes with my fanny pack (that functions as a survival kit and filing cabinet) and our laptop. The detailed stories of the survivors challenged my belief that I could surely make my dash to safety with both in hand. Years late, I realized that having a much lighter and more durable backup of our laptop on a CD would be almost as good as having the laptop itself. Luckily I shared the nightmare and the fantasy with Bill a week before our departure and he wildly embellished on my plan--he bought a 1 gigabyte zip drive and a small chip so that we can each carry a durable backup for our laptop. It's one of those solutions that seems to only pop out in response to extreme situations--fortunately this time it was only hearing of other people's tragedy instead of experiencing our own. While back home we always pore over the daily paper so as to get an updated snapshot of life in the Pacific Northwest and in the US. It certainly doesn't fill in all of the stories we missed, but it does slow our rate of obsolescence. We were back when the US Supreme Court ruled in favor of Oregon's right to die law. Yes, we are now Washington residents, but we still feel passionate about the issue that became elevated to a battle over State's rights for some of us. Sadly, we were also in Portland when the suppressed hatred of many motorists and pedestrians for cyclists erupted on the streets and in the newspaper. We were always so proud to be from one of the US's top cycling cities and were deeply disturbed to learn of the animosity. We couldn't help but wonder if it wasn't in part fueled by the climate of fear and hatred that our President has cultivated for so many years--that perhaps that emphasis on "we-they" was turning inwards now. It certainly made us apprehensive to be on our bikes on the streets of Portland and assumed the pedestrian that took a swing at Bill while on his bike was yet another manifestation of the anger that is no longer simmering below the surface. We've biked many more miles overseas than in the US but only in the US have we actually had people hit us with items they've thrown, including their arms. Though learning of the animosity towards local cyclists was something we never would have predicted, the weather while we were back home this time was more predictable, unlike the previous year. Our experience of the "Winter of 2005" was limited to the fantastic January-February heat wave that had us in shirt sleeves and flip-flops many an afternoon. The fine weather did have its drawback however in that it didn't provide the heavy rains that would have revealed the water leaks in our new Burley rain jackets. And last year couldn't have been more different than the previous one with its unusually heavy dumping of snow outside and ice forming on the inside of our attic room window. This winter was more typical in that it rained and then rained some more. It was a record-breaking and near record breaking string of wet days with close to 15" of rain in a month's time. Luckily for us, the week of nice weather that we usually get in February overlapped with our last week allowing us to savor the sight of stars at night and nab several views of the always grand snowcapped, volcanic mountains in the region. The gradual development of an echo in our attic room and its associated stairwell that began our last week at home was yet another reminder that we were once again getting packed up. The jackets hung on hooks in the stairwell were now hanging in the closet, no longer dampening the sounds of our feet on the wooden stairs. Then our sleeping room developed that rarely heard hollow sound as the sewing machine was covered and returned to its corner and the pile of clothing and gear became contained in our suitcases. And on the last night, the sound in the anteroom where our boxes of belonging were once again neatly stashed harmonized with the acoustics of the sleeping area and stairwell. The contents of boxes filled with sewing fabrics, touring supplies, and financial information that seem to explode when we arrive were again well contained within their boundaries, no longer deadening the sounds as we walked across the linoleum laid when Bill was a toddler. A little last minute work on the 2002 album. As the earlier occurrence of the echo-sounds confirmed, Bill was far more organized that ever before. 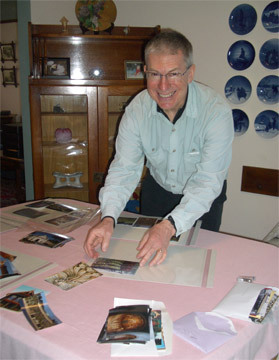 Instead of deciding what wasn't going to get done at midnight before we flew, he had time to work on our 2002 photo album. We even spent an hour trying to finish it up before our flight the next morning, though we still have a little over 100 of the over 700 photos to go. Sadly, we had to settle for "Next year...surely we'll finish it next year." Since we had so many photos in 2002, we assembled some of them into an abridged version to share with friends but ran out of time to compile the final unabridged version, hence this lingering project. So, the 2002 photo album was the last project for the year to be put away before we headed for the airport for our nonstop flight to Frankfurt. We are in Cairo for the second time, having made our 3 week non-cycling tour of northern Egypt. Because of deteriorating politics, we chucked our dreams of biking across North Africa and decided to do our sightseeing in Egypt as conventional tourists. Besides, its still too cold and snowy in Italy in early March to enjoy being on our bikes so why not go to Egypt? Tomorrow we fly back to Berlin to pick up a stashed suitcase and then the next evening we fly to Pisa, then hop a train to Florence. We'll stay in Florence a few days to do seasonal maintenance and get some heavy bike parts out of our luggage. New chains, new cables, new handlebar wrap, a new saddle for me, and cleaning the grit out of the gears will be the priorities. Then at last it will be off on our bikes, heading west to the Italian coast. I've been busy working on my Egypt files, so hopefully the first of 3 will be out soon.